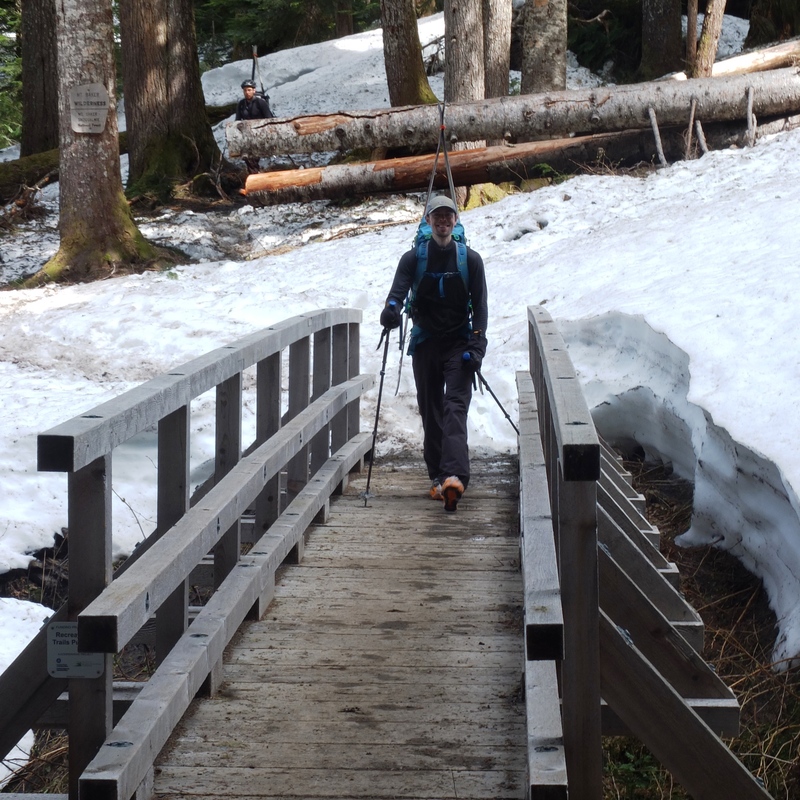 About a month before this trip happened, conversations started up around doing a Victoria Day long weekend ski traverse. However, in the few days coming up to the weekend, despite a blue-bird forecast, the predicted temperatures were going through the roof and folks involved in the email faff was expressing reservations about the possibility for a big spring avalanche cycle, as temperatures had not soared to these elevations yet this spring. We also all seemed to busy (Coffee Table Book, anyone?) to invest serious time in planning, which didn’t help our case. Come Friday morning, with still no firm plan, I pitched the idea of a self-propelled ski trip to Mt. Baker. 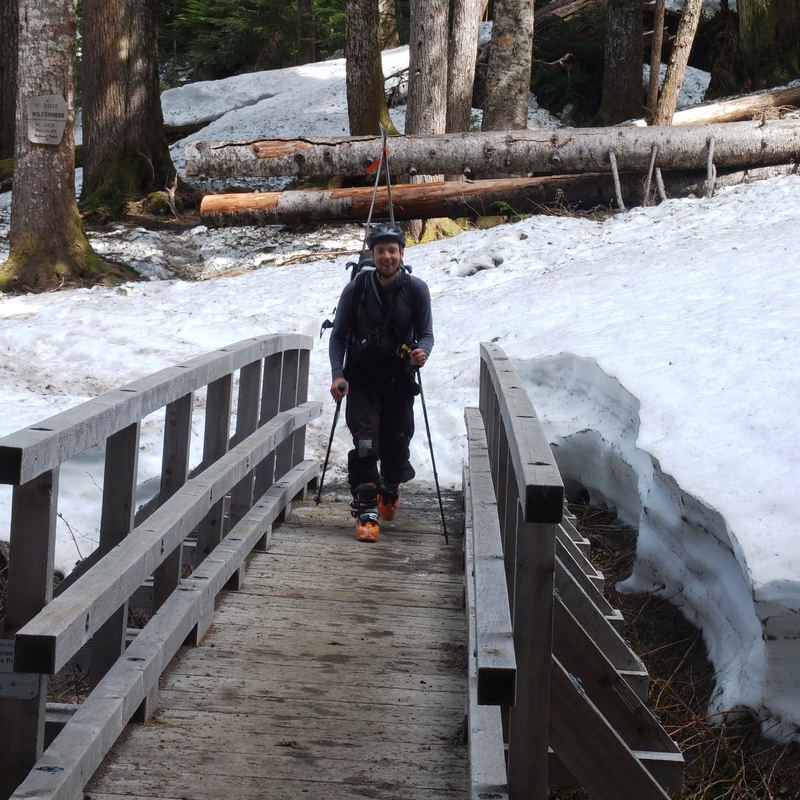 The logic was that we would have fun cycling regardless of what sort of funky business avalanches would be up to, and we would still get a dose of spring ski-touring on the relatively low-angled glaciers below Mt. Baker. The main objective was just to bike there, and get some turns in; the summit was not in our plans given our concerns about the warming temps and the mountain’s steeper upper slopes. 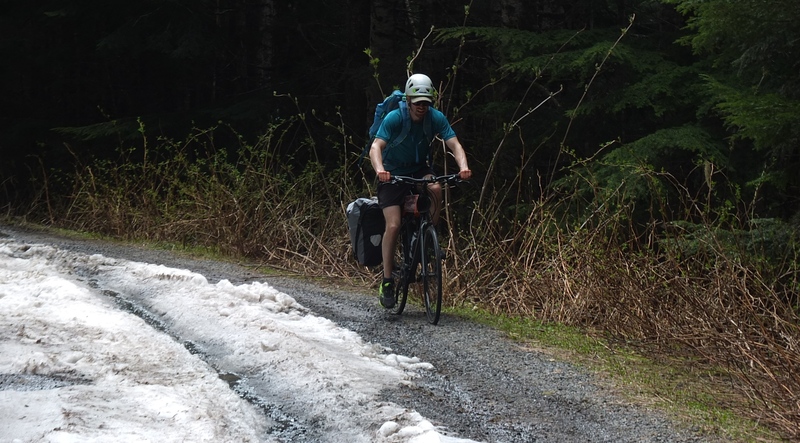 Martin and I have talked about bike touring a ton, and we also regularly lament our society’s reliance on automobiles, so I wasn’t surprised when he took the bait he jumped on the bike-n-ski bandwagon. We chatted on the phone, and agreed that this trip required a critical mass of three to go ahead, and just about then Mirko expressed somewhat timid interest in joining us. Now Mirko hadn’t done a whole lot of bike touring before, and just when we thought we had our crew finalized he phoned me at 7 PM Friday evening, quite worried that we were dead-set on peak-bagging and also unsure about his lack of cycle-touring experience. A bit of reassurance about our trip of objectives (have fun / cycle / do some turns / consider the summit only as a plan B if we like the conditions and are feeling good) and he was hesitantly convinced. With the planning details sorted out, the stage was set some bike-n-skiing to happen. 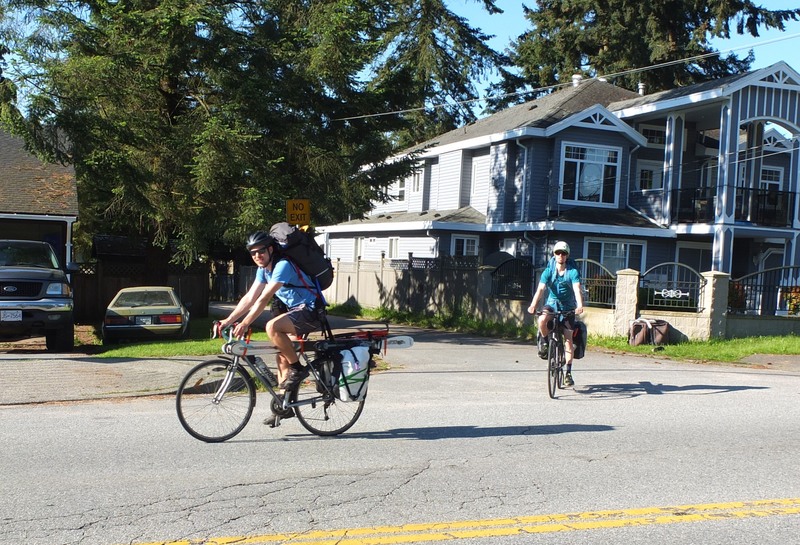 We had to drive to Martin’s house in Surrey on Saturday morning, because he needed to borrow a bicycle from me, and I had not found a solution to delivering two bicycles to Surrey with a single person. 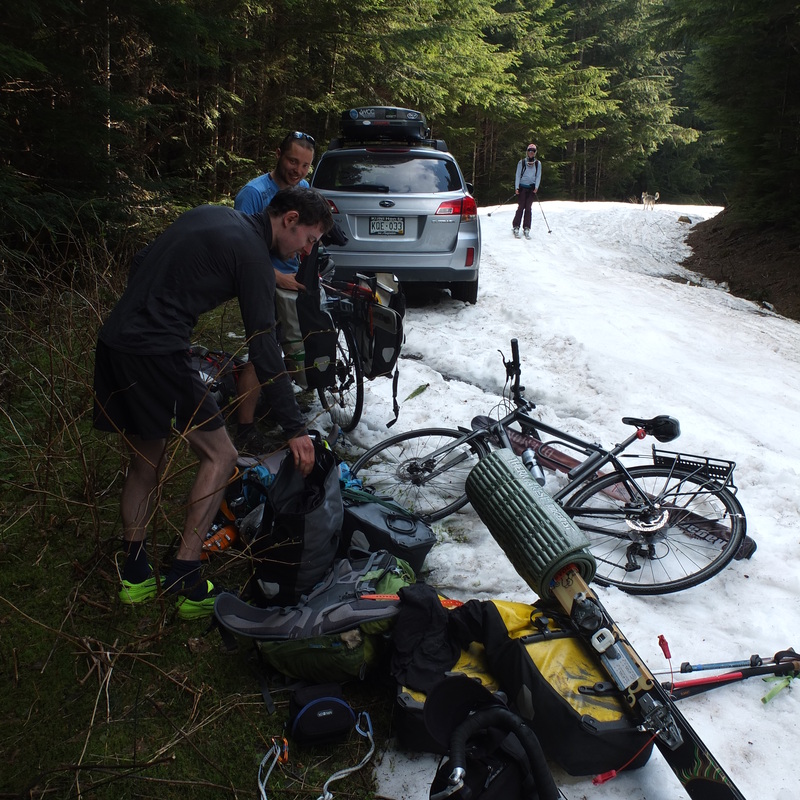 It took about an hour to rig up our bikes with all of our camping, skiing and glacier gear splayed on his lawn. Mirko remained unsure about the viability of the bicycle approach, and stared at me incredulously when I offered him some chammy cream to make for a smoother ride (‘is this a joke?’ he asked). Finally, we started cycling from Surrey around 8:30 AM. The next couple of hours were spent fending off hogs (the motorized version) and rigs barrelling alongside us on Fraser Highway in the hinterlands of Surrey-Langley suburbia. This is the most direct route to Mt. Baker and has a good shoulder for cycling, but came at the expense of noise , fumes, traffic lights. At least there as pleasant mix for scenery consisting of car shops and three story-high car-wash facilities. The Land of the Motor. 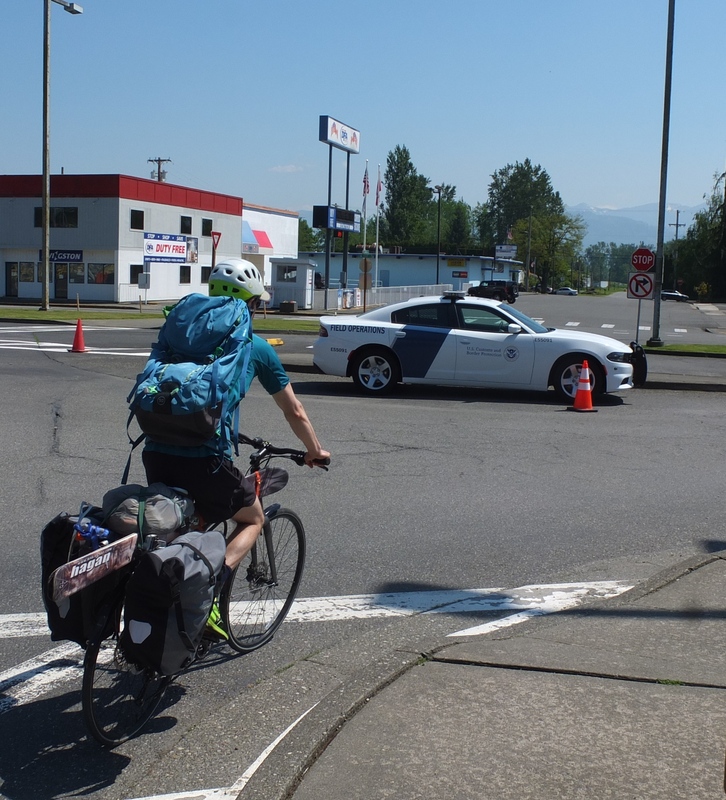 Eventually we split off on side roads in the countryside – much better – and crossed the border at Sumas. 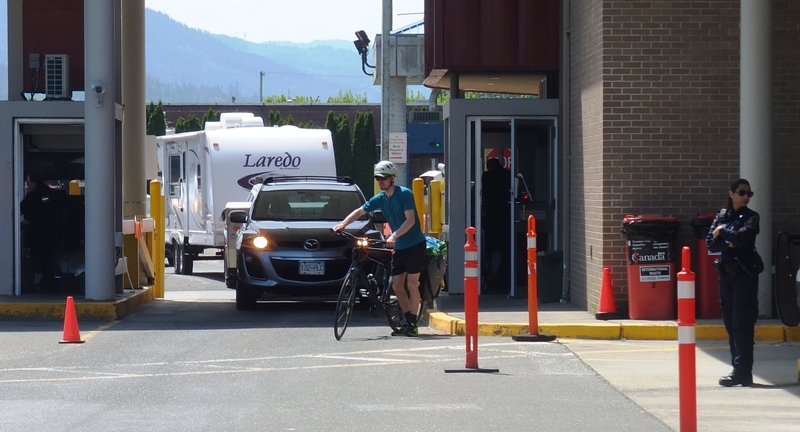 A brief stop for groceries at the IGA in Sumas was required, as fresh fruit and dairy isn’t allowed across the border. This worked out less ideally than planned because bad exchange rates had driven the IGA out of business on Monday prior, and the store shelves were reduced to a handful of packaged goods. Well, it made our grocery selection easy (‘take what you can find’), and we readied to leave the flatlands of the Fraser Valley and begin climbing the foothills of the Cascades. 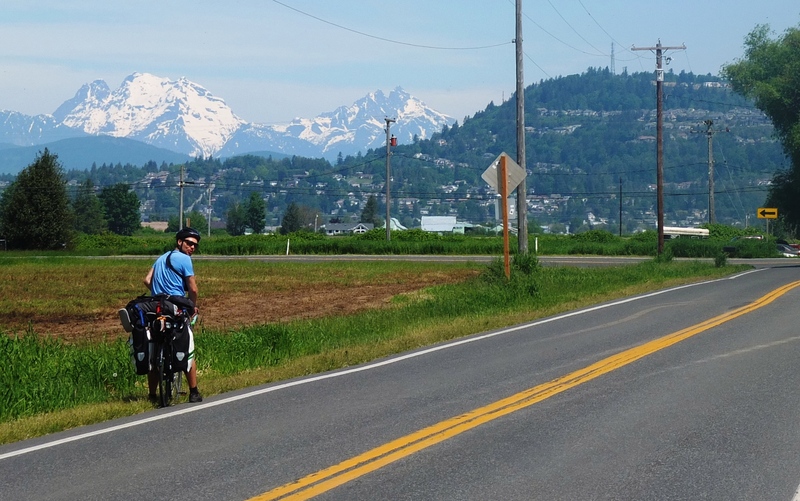 Of course, a cycle-tourist’s crossing into Washington on a bike implies an immediate metamorphosis from busy traffic-jammed suburban warfare for space on the road to peaceful cycling on excellent country roads with phenomenal mountain scenery — and it was! 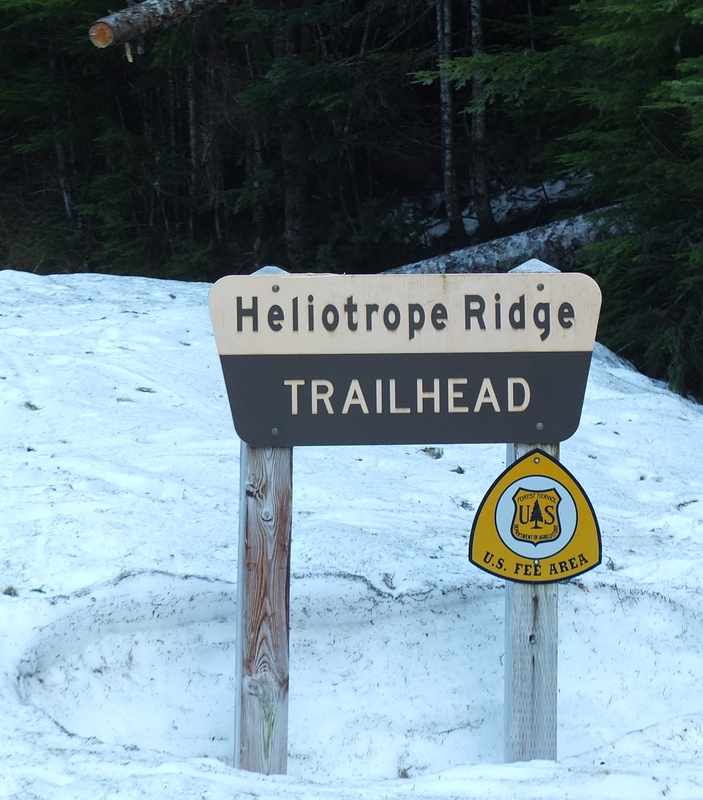 The ride into the tiny town of Glacier, WA was lovely and had a good amount of hills to warm us up for the big one: the climb to Heliotrope Ridge trailhead. This we began around 5 pm; a 14 km bike ride that gains ~700 m. Each meter was preciously won in a continuous battle staging quadriceps and calves on one side, fierce allies against the forces of and gravity, skis and camping gear on the other; a couple hours of intense battle and newfound wisdom into the limitations of bicycle gear ratios, and the fairer side emerged victorious. After stashing the bikes in the woods, we geared up for ski-mode and did the leisurely 2-ish mile skin on the road to the proper trailhead, where we would spend the night. 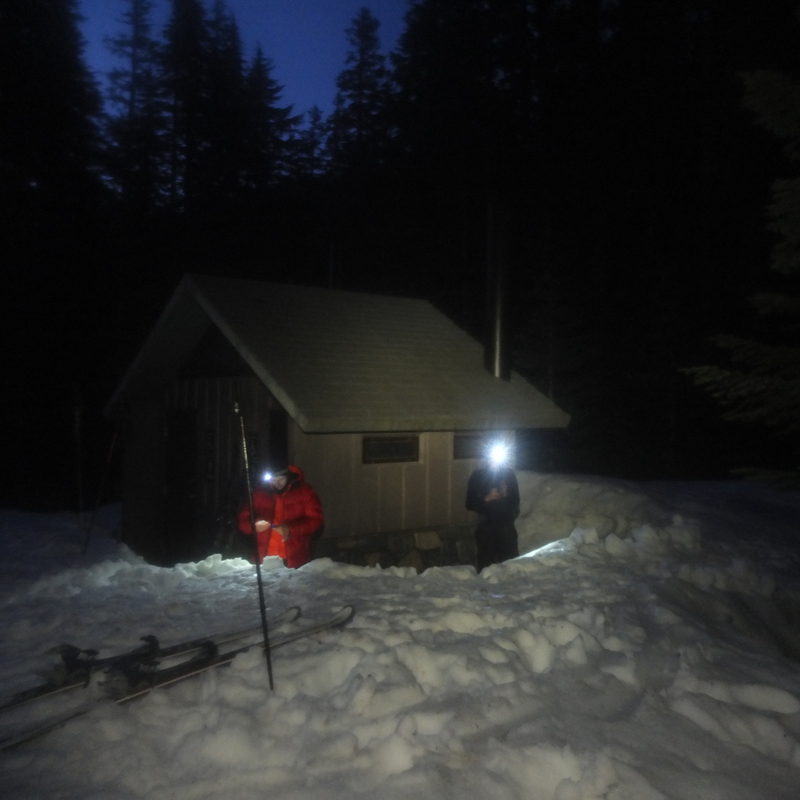 An outhouse provided a great solution to avoid worrying about animals getting into our supplies overnight, and during the next day’s skiing effort. A quick dinner, and we splayed out under the stars a short distance down the road and caught some zee’s. Alpine Start. The outhouse was a great place to stash gear for our ascent. 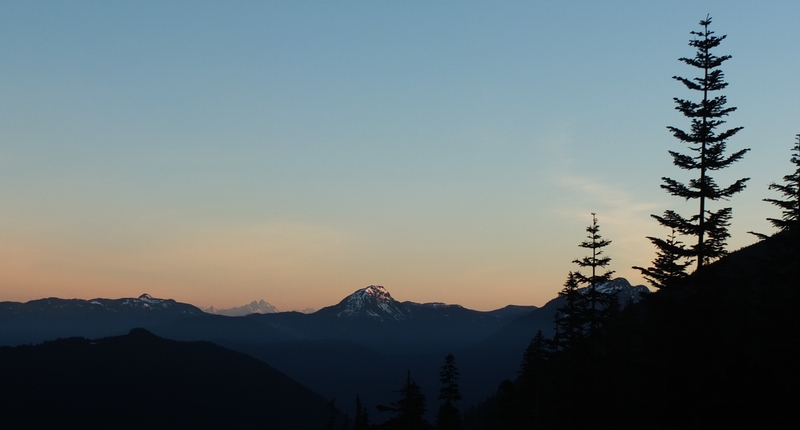 Next day, a 3:30 am wake-up came a bit earlier than our tired bodies asked for, but we forced ourselves out of the sleeping bags, stashed our overnight gear in the outhouse, and started on the Heliotrope Ridge trail at 4:30 am with headlamps. We had some discussions about how the clear skies should help radiate lots of heat out of the snow and hopefully freeze things up for safer climbing conditions, and this became really noticeable when we reached treeline, where within a meter or so of any tree the snow was quite mushy, but it got firmer in the clearings. We were obviously not the only ones thinking of spring-skiing this weekend! 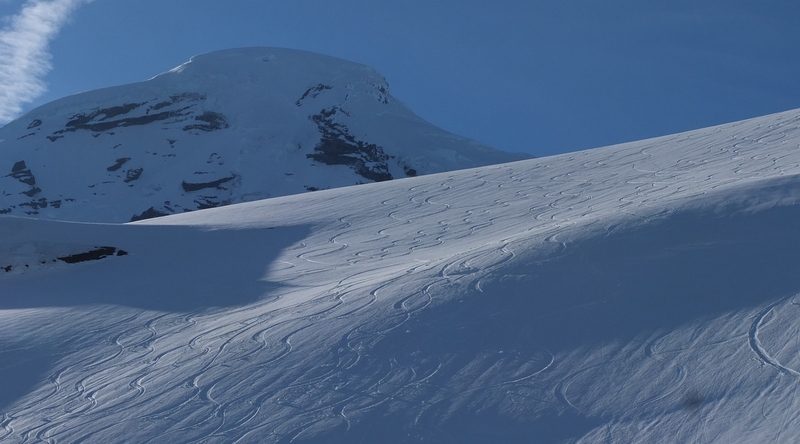 Mount Baker is a busy place! As we reached the Baker-Colfax col circa 3,000 m around 10 AM, and had a little pow-wow to discuss whether or not we wanted to try for the summit. 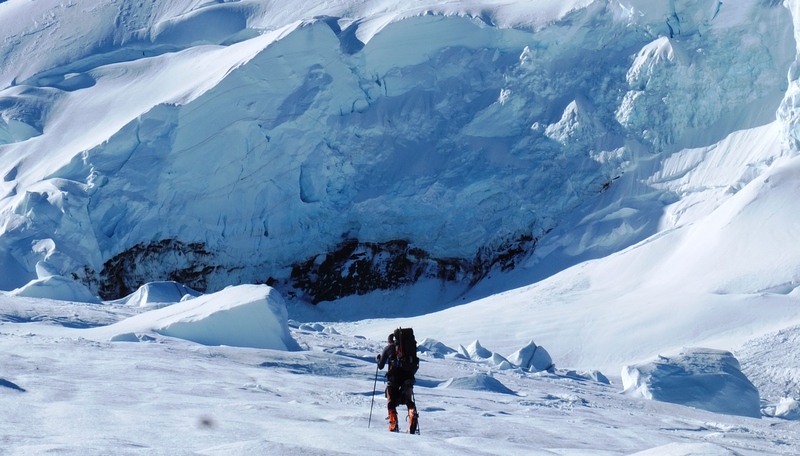 I was feeling very tired, and I recalled last year that the ski descent felt fairly exposed with gaping crevasses on the Easton Gl below; I did not want to ski down this on wobbly legs. Martin was keen to give it a shot, having not been up Baker before. We hummed and hawwed for a little, noting that the snow was still rock-hard (thus safe), and then started ascending without making any commitments to summitting but figuring we at least had plenty of time on our side. For the last 300 m climb to the peak, ski crampons worked their magic, except for poor Martin who had to bootpack (not having ski crampons). The route was actually much less steep than last year, as I recall. Perhaps due to better snow coverage? I don’t think it exceeded 35 degrees … Anyways we marched on and upwards. Martin started to take the lead, Mirko started lagging behind and I got into serious slogging mode, feeling really beat, but not wanting to bail and transition into ski mode on a 35-degree icy slope. So I slogged on, taking ten steps and then breathing for a bit, and then repeating the process. Usually, as a type 1 diabetic, when I feel this weak I can blame it on low blood-sugar, but a quick blood test with a perfect blood sugar reading told me I didn’t have diabetes to blame for my fatigue; I was just plain pooped! At one point, about 80 m below the summit, I figured I might switch to bootpacking, just to use different muscles from ski-cramponing, so I did that, but it didn’t give me the expected second wind. I guess when you’re gassed, you’re just gassed! 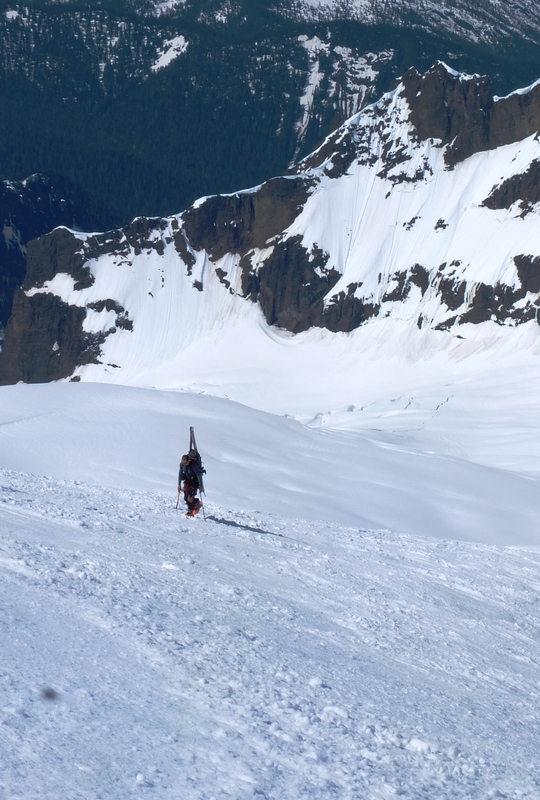 Martin eventually disappeared out of sight, and when the slope angle eased but I still could not see him I began cursing him in my head for continuing further, as I would have easily been convinced at any point to say: ‘screw it, I’m tired, let’s rest and head down’. Anyways, eventually the angle mellowed enough that bootpacking seemed ridiculous, so I put my skis back on, but was too tired and lazy to remove the ski-crampons, which is also ridiculous as the angle was less than 20 degrees. So I ski-crampon/shuffled onwards on the flattish softish hump leading to the top of Baker. 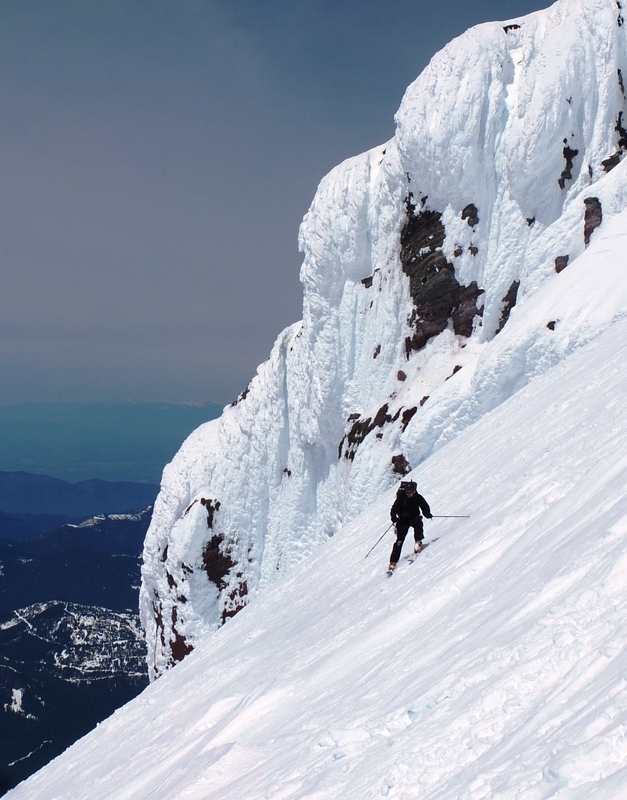 Mirko, showing some stoke at the summit! Finally, I crested over the bulge and saw Martin basking in the sun at the summit. I don’t quite remember the moments that ensued; we may have exchanged congratulatory high-fives, or not – I was too gassed to recall. 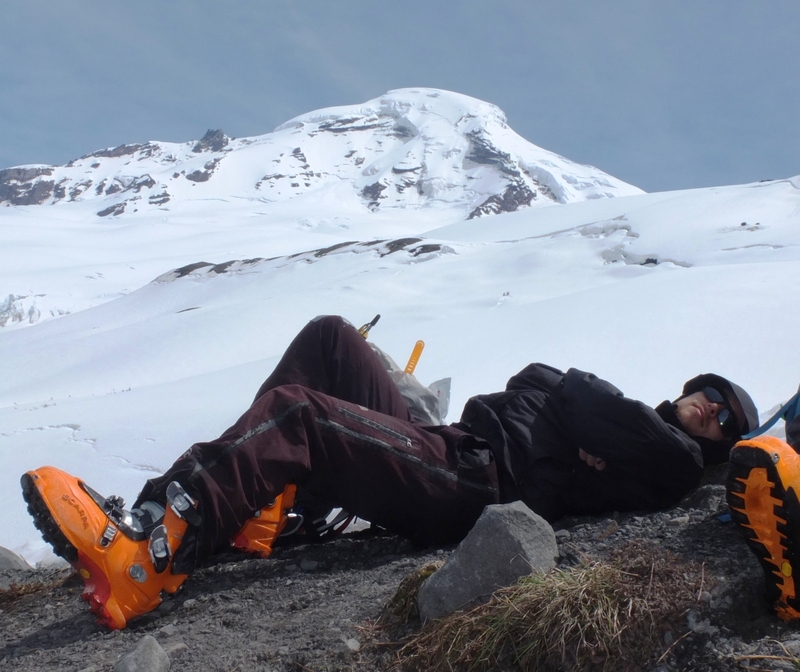 However, I do fondly remember plopping my pack on the snow, and promply emplacing my bottom upon it, at which point I was able to lie in complete immobility, letting my muscles do absolutely nothing. Martin and I sat side-by-side, pooped, too tired to talk or do anything of much use. While waiting for Mirko, I decided I should probably make an effort to keep hydrated and energized, so I began melting snow in my black shovel blade (much more effective than other surfaces that were attempted; hard-shell jacket and aluminum emergency blanket) and munching on bars. A short while later, around 12:15 PM Mirko finally dawned on the horizon and joined us in our newfound hobby of doing nothing. 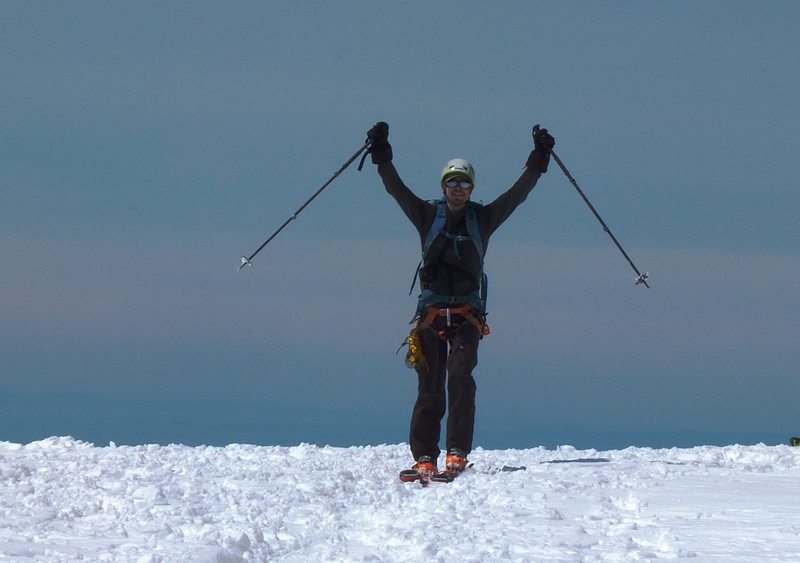 The summit was perfect – no wind, full sun, warm temperatures. Most importantly, no body movement required. We sat and rested for a while, deciding on when would be the perfect compromise in timing between resting enough to be re-energized for the steep ski descent, and not wanting to wait too long as the sun was baking the Roman Wall and we had some reservations about degrading snow stability. When the optimal timing was deemed to have been established, we took a quick summit group picture and ripped skins. Summit! Martin, Elliott and Mirko. Notice the bicycle helmet – a testament to our ways! The descent, I have to say, was blissful (for me). 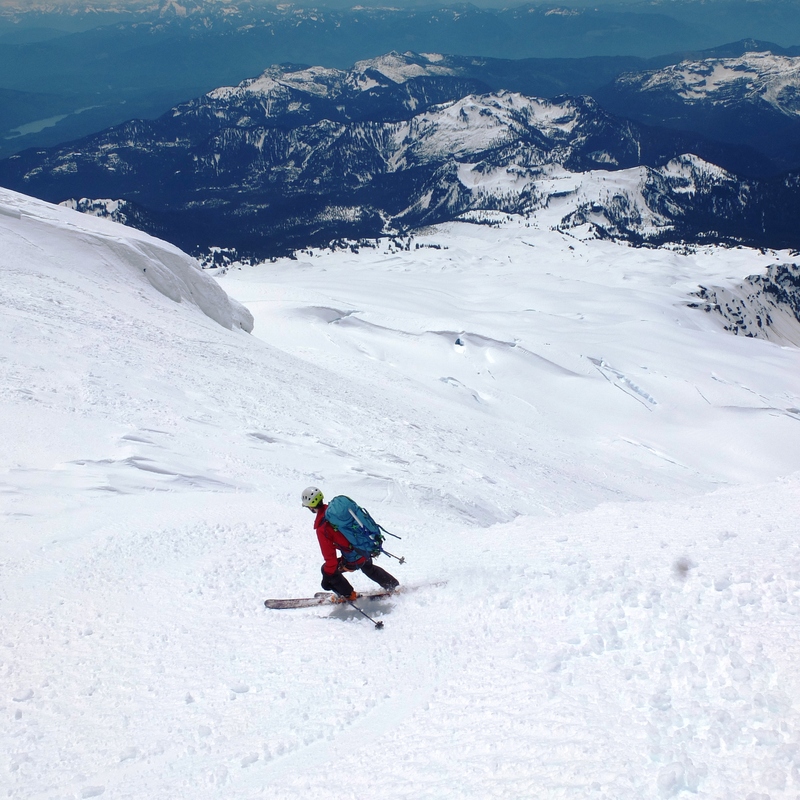 It felt much less steep, and certainly was softer than my first and icy ski descent of Baker last year. I enjoyed the turns very much – good corn and my legs felt solid. Martin was a bit shakier on the descent, but made it down just fine and soon enough we were cruising down good corn slopes, relishing the 2,000 m ski descent from the summit back to the trailhead. Just before reaching treeline, we stopped at the first snow-free rock outcrop, and lay down for a few more minutes of ”doing nothing”. I also noticed my ears popping from going down; that was a funny new thing for me. The ski out through the forest was again uneventful, finishing with a short 500 m bootpack to the trailhead, which we reached around 3:30 PM. With plenty of daylight to go ’round, but not so much energy in the tank we invested another fantastic hour into ”doing nothing”, which involved brewing some tea and napping. At some point we decided we were good to get moving, so we packed our overnight gear and skiied down to the bikes, spent again an hour transitioning into bike-mode and cruised down the 10 km road to Glacier. The bike ride was awesome: no pedalling required, no traffic to worry about, one long downhill. 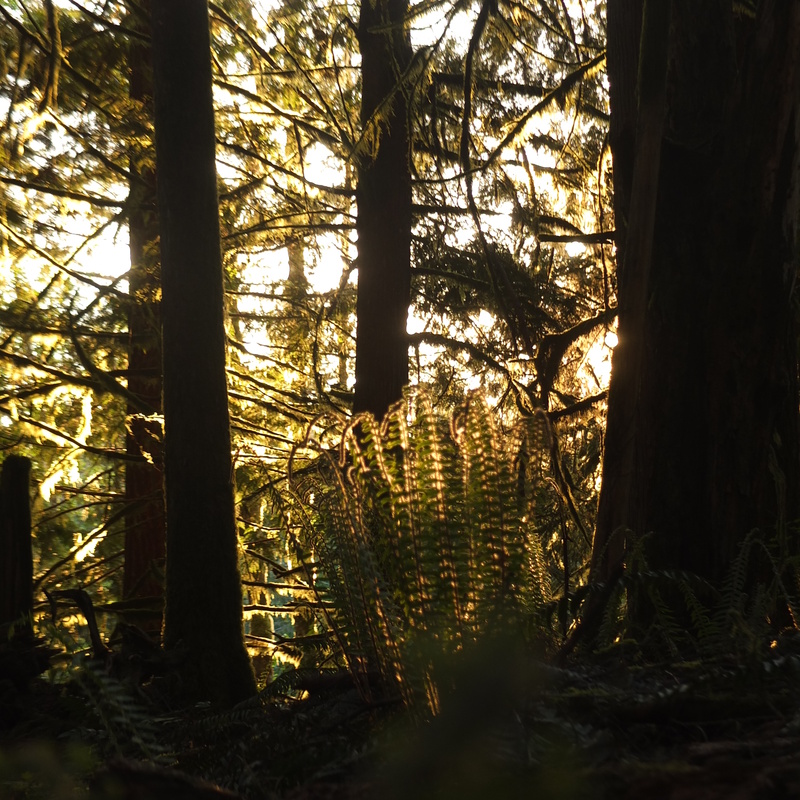 The evening light shining through the moss-covered rainforest was simply magical. The last phase of the trip can be summarized in a few words. We ninja-camped in a nice flat bench near Glacier, where we devoured most of the food that we still had leftover. Overnight, Martin selflessly attracted the local posse of mosquitoes, such that Mirko and I could enjoy peaceful sleep. Next morning, sleeping in until 7:30 AM, then off to the Wake n’ Bakery (highly recommended) for espresso and burritos. There were lots of burrito options, but the choice was easy: ”Major Burrito” it was. Breakfast burritos poured into the gas tank, we cruised back to Canada. 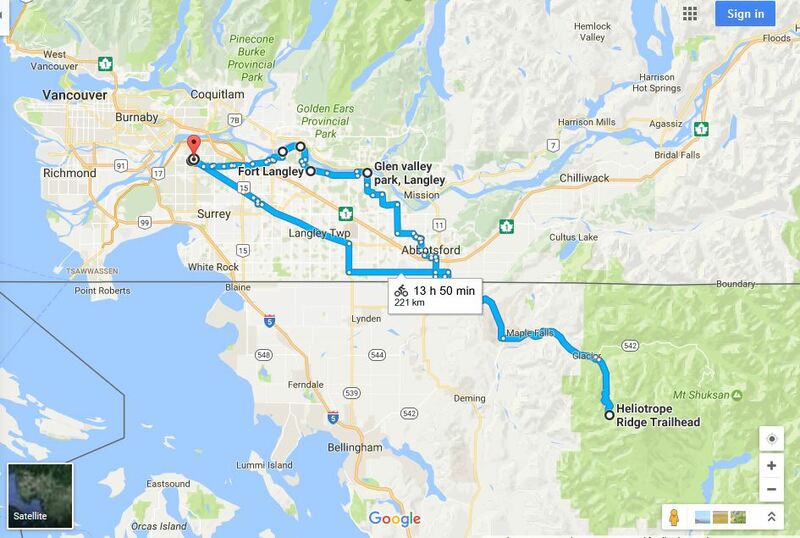 This time, rather than taking the busy Fraser Highway, we opted for a longer but much nicer bike ride back to Surrey by riding North along Bradner Street to the Fraser River, and then finding quiet country roads and eventually off-street cycling paths in Surrey back to Martin’s house. A break to swim in the cold Fraser River did wonders on our bodies, and probably also for the ambient air quality. Fraser valley salmon likely disapproved, however. Finally, we got back to Martin’s house around 6 PM, capping off the self-propelled portion of our adventure. This was definitely a highlight trip. 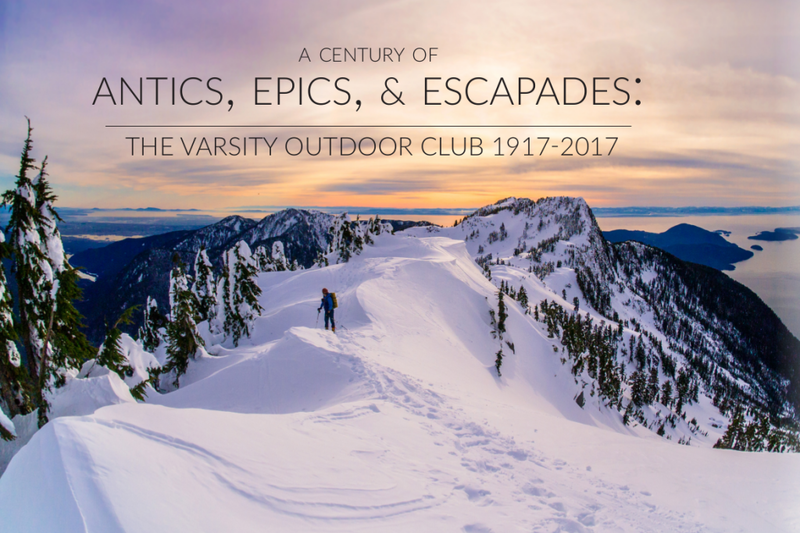 It combined two of my favorite pass-times (cycle-touring and skiing), making for a factorial fun time.The variety of locomotive means, urban and wilderness settings, forest and glaciated alpine meant a constant evolution in landscape. The weather was picture-perfect, the conditions on the mountain also. We had a great crew and all of the decision-making (where to camp? should we summit? should we stop for water?) happened organically. Mirko, relatively inexperienced as a bike-tourer, thoroughly enjoyed the activity. 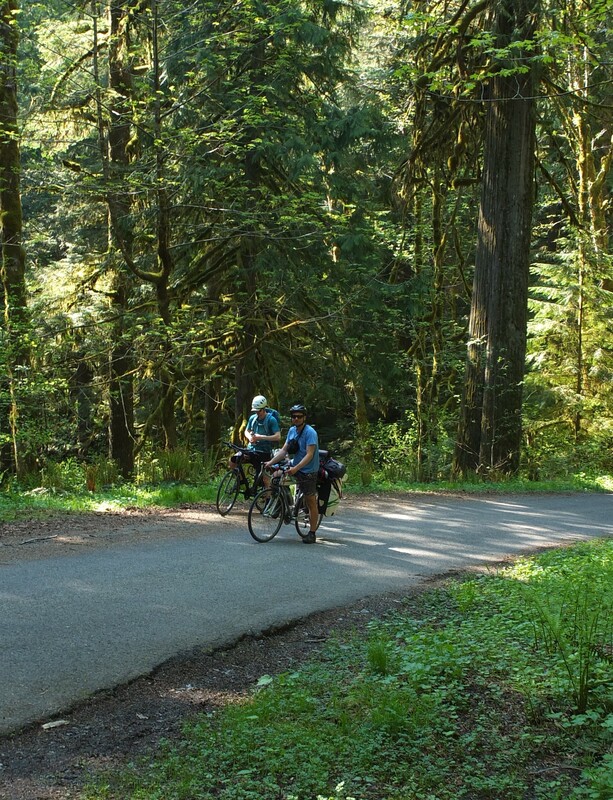 Martin and I dreamed of bigger plans (bike-n-ski the Cascade Volcanoes???) for a future life when time will be a more available commodity (pipe dream? ), and we all got home with just the right mix of type 1 and type 2 fun and awesome memories that make three days feel like a week’s vacation. 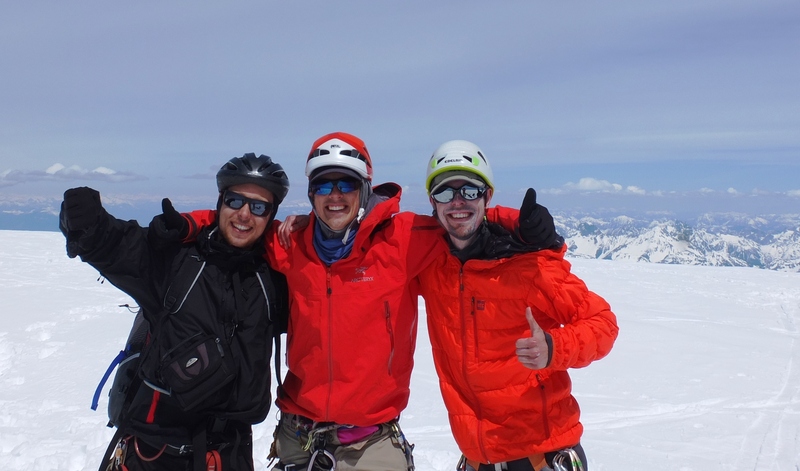 The three-day trip involved 221 km and 1,083 m in elevation gain by fully-loaded bicycle, and 20 km and 2,160 m in elevation gain on skis. I think we did a pretty good job packing-wise, but to do it again, I would only pack food for 2 days (not 3); if you have it in you to go up and down Baker as a day trip after cycling to the trailhead, you could get away pretty easily to ride downhill all the way to Glacier and eat a well-deserved burger in town. I would also not bring a winter sleeping bag (we had tossed the idea of skinning up to Heliotrope Ridge on Day 1 to enjoy evening views, but that idea was canned pretty quick after the gruelling bike ride up Glacier Creek road). The Crew: Martin, Mirko and Elliott. Enjoying breakfast at the Wake n’ Bakery. All good cycle tourists know the feeling of finding that sweet local coffee shop! 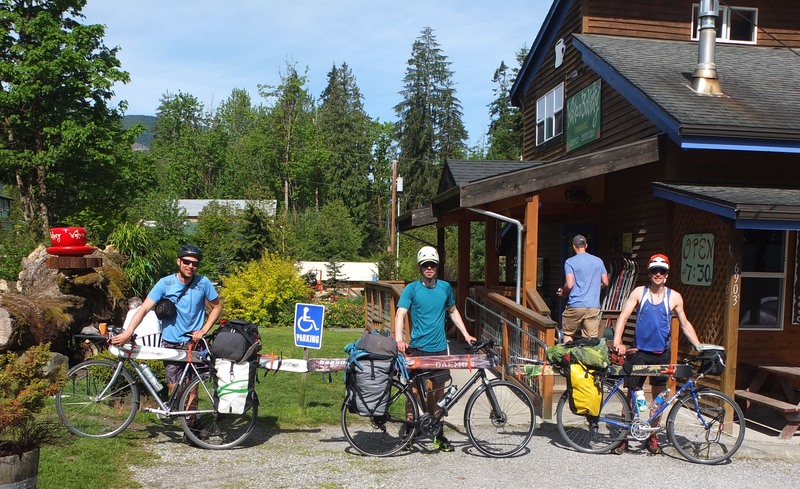 Welcome to bike-touring in Washington! Quiet roads, great scenery. 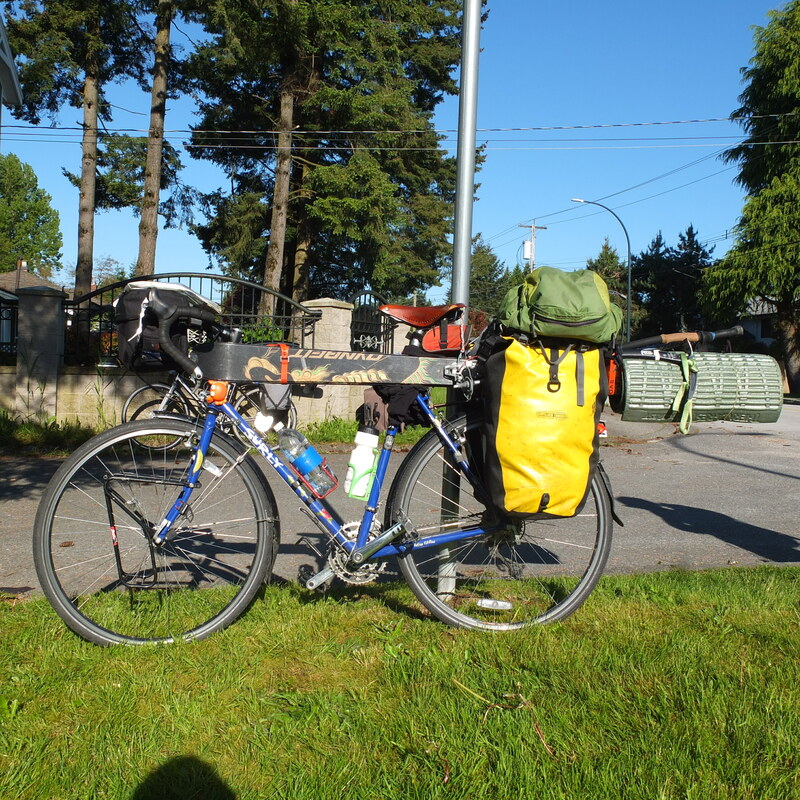 This entry was posted in Cycle, Ski, Trip Reports and tagged Baker, bike touring, self propelled. Bookmark the permalink. Wowowowowwwwww!!! Awesome! Holy smokes, you guys rock! Now we know! To the top!! How did you manage to fit everything into your panniers though?!? That’s crazy! The ski boots too?? And rope? I hope you had a good bike tour with Clemens and found some sweet camping spots by the sea — what a weekend to be outside! We managed to pack pretty light thanks to the weather forecast: no tent (tarps only), jetboil for a stove, mostly dehydrated/dry foods. We carried one of those 30 m 7.8 mm Beal glacier ropes, so it only takes about 2 L of space. All of the camping, skiing and glacier gear and food fits pretty snug into two panniers, and then you need to find somewhere for the ski boots (I had mine in my backpack, strapped on top of the bike rack). To be honest, I probably carried more gear on multi-week bike tours before with more luxury items (kitchenware, music instruments, books, spare shoes etc) so packing light, and adding ski gear actually felt fairly reasonable on the bike!